I am almost finished with the new blue skirt, a McCall's pattern. I am truly pleased with the fit. The front piece has tabs inserted at side seams and then are stitched to the front using buttons stitched through all layers. I pinned down the tabs and then auditioned several navy blue buttons I had in collection. These are the buttons I decided to use. I tried a new technique for stitching down the waist facing with the invisible back zipper. I recently read this blog post about facings. I thought I had bookmarked it; but when I got to that part of sewing my skirt I went to computer to pull it up to print it out. I could not find it. I did find this bookmark about facing and invisible zipper by Els at The Sewing Divas blog. I used Els technique on this one and it worked like a charm. I have now printed out Dawn's version and Els for future use. Both techniques yield a nice finished facing and no hand sewing!!! Maybe it is me but this fall's issue did not do anything for me. I know from reading many blogs that a lot of us look forward to getting the fall issues of several magazines, Vogue, being one of them. DKNY had some great garments and that ad was at the beginning of the magazine. So I had hoped that as I continued looking, I would see more. I did see a few other pieces but again nothing blockbuster. Perhaps it is me. I purchased Allure and InStyle to look at as well. I subscribe to Lucky and had reviewed that one earlier. Plaids and block colors are my take aways from the magazines thus far, along with ruffle and tie collars for blouses. If you did review this issue of Vogue what were your thoughts, take away? I love to get mail. My husband calls me a "mail freak". Walking down my driveway to the mailbox is good exercise but it is a thrill to open it and find that I have got mail. When I am away, my DH brings in the mail and puts it in my lazyboy chair. It was great to see the things I got in the mail-JoAnn'sflyer, Threads Magazine (I have not finished reading the previous one), two newsletters from two somewhat local independent fabric and sewing machine dealers. These should help restore my sewing mojo. I spent the last two days in Richmond on business. Our meetings yesterday started at 10:00 which meant I and my staff person had to leave at 7AM to make the meeting. We broke for lunch and dinner with business wrapping up around 7:00 PM. Hotel check-in and a drink at the bar before hitting the rack. I took my new Vogue Patterns magazine with me but I never opened it. Today's meetings started at 7:30 and ended at 1:30, travel back home another three hours. Whew, I feel tired. My employee and I like to sew but this trip did not allow for shopping at all. This was probably a good thing. I will say that I have been designing new fall clothes in my head. Soon I will be taking a week off from work and plan to sew several items. I am ready to start my fall and winter garment sewing now. After the wadder disaster with the blouse, I sort of lost my sewing mojo. I am now past this and plan to finish up my blue skirt this weekend. I decided it was time to end my agony. The blouse is just not doing it for me. I think it is the wrong marriage of fabric and pattern. I always hate when I think I have wasted fabric. I think that it would have been better to use this fabric for skirts or capris, not this blouse. It was becoming more and more frustrating to work with this. So I am putting it aside. I really don't think that I like the pattern either. 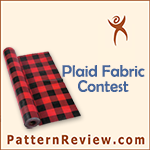 Thus I am going to start on the McCall's skirt pattern using an alternative blue fabric. Remember this post. So now that I have the fitting kinks worked out with this skirt, I am ready to make it again. I have the zipper and thread, so I am good to go. Today has been a good day. I got drapes and curtains for the house. Curtains were for the kitchen. I put those up. Drapes are going to require a little assistance from DH. I bought the curtains at Bed, Bath and Beyond. I love that store. They have more gadgets and stuff for the entire household. I bought some stack and lock food storage containers. I have not bought things like this since we moved into the house almost 6 years ago. Thought it was time for a change. I went to B&N and purchased the fall Vogue and InStyle magazines. Trying to get pumped up for some fall sewing. I started working on the blouse again. I found a few sewing flaws with collar attachment to blouse, so reworked that. Serge finished the sleeves and then got side tracked on doing some other things in the sewing room. 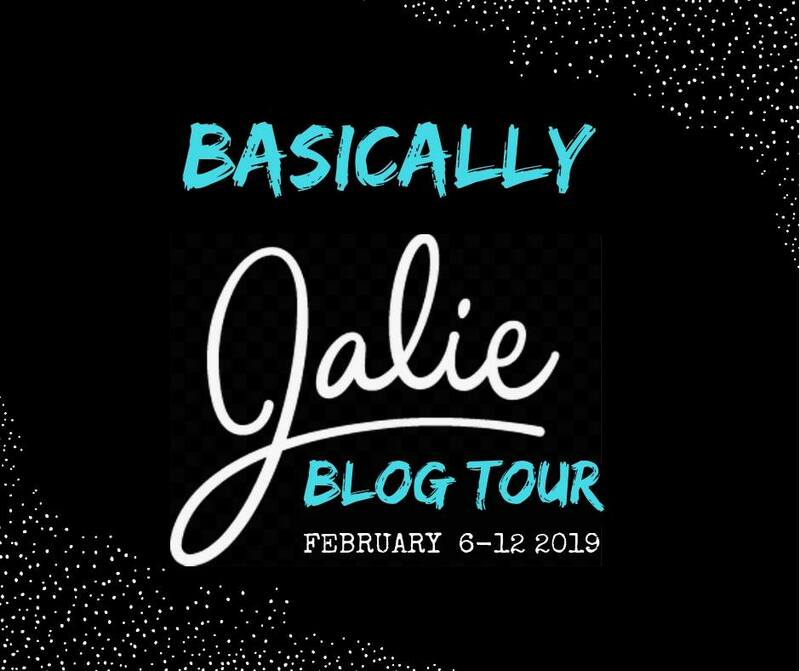 Then discovered it was time to start dinner so got that started and decided to post a little to the blog while things are simmering. Well my plan is to finish the blouse that I have not been able to do much with at this time. The collar stand and collar are complete. Sleeves next and then hem, buttonholes and attach buttons. All of this sounds like easy things to do. Yet sometimes I am amazed at how long it takes to do these things if you can not sit and sew without interuptions. DH is suppose to work tomorrow AM so that gives me some time without interuptions. Yet I also need to do some housecleaning (yeck) and plan to put up new drapes and new curtains in living room and kitchen. I am being Suzi domestic which I unfortunately am not. I hate housework and such with a passion. I have a refrigerator magnet that says--"We both can't be beautiful at the same time, its me or the house". I was in Charlottesville on Monday visiting some of my staff in the area. Through the blogging world and contacts made through that, I learned that Elaray whose blog is Another Creation was in the area as well since her daughter attends college there. We were able to meet up at Les Fabrique. It was a pleasure to meet a fellow blogger /sewist and her friend who does not sew but has great taste in fabric. I will have to take a photo of the fabric I bought influenced by the non-sewist who said something like "that would look great with a brown suit". It was interesting that we talked about other bloggers' garments, fabrics, patterns and the like. It was like we knew so much about others through our joy of sewing and blogging. I wish I could have stayed longer and visited some other stores with her and her friend but I had to return to Roanoke and work. Elaray, I hope your trip was pleasant and that your return home was safe. Linda T, thank you for your suggestion. I too like Louise C's instructions/techniques for collar and stand. I used one of hers on pressing the collar seam allowances open and using a pressing edge. The pattern instructions offered two methods of attaching the collar and the collar stand. My preference has always been to attach the collar to the collar stand first and then attach the unit to the neckline of the blouse. I completed sewing the two items together and pinned the collar stand/collar to the neckline. Dinner became an important issue to take care of; so my sewing is pretty much complete for the day. Yesterday, we visited my MIL and my DH's cousin in Danville yesterday. We had lunch with MIL and then did some shopping at the local mall. Upon returning home yesterday evening, I spent time starting on the McCall's blouse, I made pretty good progress with sewing darts in the front and back, serge finishing seams. DH wanted to eat some dinner and watch a movie, so sewing ceased for the evening. Today I have worked on the blouse some more. I have not made a blouse with a front placket in years. I decided to follow the pattern directions for this up to a point. Once you attach the placket they would have you slip stitch the folded edge over the seam where you attach that part of the placket to the blouse. I always have an issue with this and do not understand why they do not have you stitch in the ditch to secure this. Industrial sewing does not slip stitch. So I stitched in the ditch to secure; much better than any slip stitches I would do. Thank goodness it is Friday. Since my vaca day on Monday, I have not been able to do anything in my sewing room. I will thread serger and sewing machine tonight or die trying so that I can start on the McCall's blouse. Once that is complete, I plan to get a jump on my fall sewing. I purchased three more patterns that arrived yesterday. I must stop buying patterns. I no longer have anymore drawer space for patterns. I need to cull some and try to get rid of them. I listed a few on PR and will probably try eBay again. I have already donated many to Goodwill. I am anxiously awaiting the release of the fall fashion mags to get some more garment ideas. I got my Lucky magazine last week. I have previewed some of their fall line up. I am loving the 40's look. Well yesterday proved to be such a great vacation day. 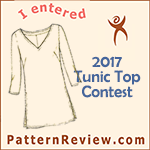 I completed the Simplicity top to wear with the McCall's skirt. I was able to also cut out this McCall's blouse pattern. I am going to make View A with View D sleeves. My original thought that this would be an overblouse to wear over the aqua top. I am not sure that this will work or not as the Simplicity top is really rather full in the shoulder area. The sleeves are dropped sleeves and there are pleats in the front at the shoulder and gathers at the back. However, I think that the blouse will work on its own. We will see. The fabric is similar in weight to the skirt fabric and it does have some stretch. To my way of thinking, I feel like the weight of the fabric makes it more of a jacket style than blouse. Yet I was drawn to this pattern for this fabric. We will see. As Carolyn-Diary of a Sewing Fanatic-says sewing is a journey. Originally uploaded by Danvillegirl Simpliciity top worn over the skirt with belt. I did not have enough material to cut out the tie belt for this top. Originally uploaded by Danvillegirl Simplicity top 2594 with McCall's skirt 5523. 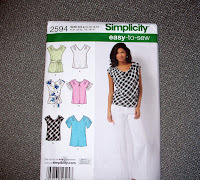 I decided to continue with sewing the Simplicity top and will cut out the McCall's blouse tomorrow. This Simplicity pattern is going together well. I wanted to sew the yoke lining differently but I could not find my old instructions for sandwiching the yoke between the front and back. I have not sewn a yoked type blouse with a lining in sometime now. I am thus following the instructions with the pattern and this will result in the yoke seams being enclosed. It will require top stitching the layers together which is okay but there is another method that can be used that would not require that. Here are some shots of the top when I stopped sewing to fix dinner. The yoke lining was pinned to the front shoulder area to be topstitched. I found my sewing room! Serger is set up for the Simplicity blouse. Sewing machine is threaded and bobbin wound. Will need to shorten sleeves as usual. So my fabric will be cut today. I will get these finished so I can wear the ensemble before fall!!! Off to my sewing room. Where Oh Where, Can My Sewing Room Be?? I am thrilled it is Saturday. I am thrilled that I have myself a three day weekend! Monday will be a vacation day! This past week was too much of a work week. The only sewing thing I actually did was to try on a pattern to determine the adjustments I needed to make. Those are noted and the pattern is still lying on the table waiting to be adjusted. All week I had plans to go to JoAnn's to get thread and a zipper for my second blue skirt. There was only one day that I even took time for lunch. My job truly took hold of my life last week. I did attend our ASG's board meeting on Thursday; the only day I left work early. I am the treasurer; and I need/like to be at these meetings. So I have great sewing plans this weekend. Though this AM I am truly doing some housecleaning; not a favorite activity either but one of necessity. Well, I was able to cut out another skirt using the now perfected McCall's skirt pattern; and I was able to use a similar blue fabric. I have to admit I had forgotten about this blue fabric and glad I decided to "shop my stash". Well, I began the embroidery process and finalized the designs I was going to use. Printed out the template, etc. The first design stitched out beautifully. I then ran out of bobbin thread and in the process of removing the hoop, the embroidery unit locked up. After doing different things to unlock it, besides shutting the machine down, I save the design combos and restarted the machine. I was simply unable to get the design to line up correctly. I decided that salvaging my skirt is just not in my cards. Nor do I want to keep futzing around with it. I found in my fabric collection another blue fabric piece that I will use to make me a blue skirt. It is the right shade of blue to go with the floral print fabric. I want to thank all of you who left comments about my center faded color on my skirt. I tried using fabric pen in similar color, on left over fabric; and Paintstick in similar blue. Not happy with results. As to throwing it into a vat of Ritz dye, gave that real thought but decided the lighter/faded area would still look off from everything else. I had an idea about embroidering on the front as did Angela. I was flipping through Designs in Machine Embroidery and that was the initial inspiration and then taking Angela's comments I have found two designs that I think will work great. As another person suggested, use a wider design so it is not right down the center. I will use that suggestion as well.